Recently, I was reminded that some of the best learning “units” we’ve enjoyed were unplanned and unexpected. They were birthed by questions raised from learning a new word, being involved in an intriguing moment, or engaging in a fascinating event. 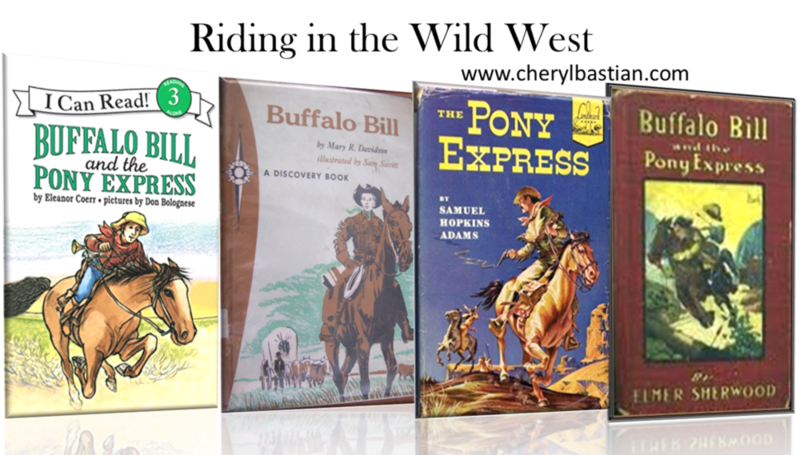 One of our most recent learning tangents evolved after reading a few chapters of The Pony Express by Samuel Hopkins Adams (Random House, 1950) to my middle schooler. In the process, the elementary learner wondered what the excitement was about and she, too, was hooked. Before we knew it we were all riding the routes of the Pony Express (Mom included after realizing she didn’t know as much as she wished she did), racing through mountain passes, stopping at rest stations, and outwitting bandits. I remembered we had a few more books about riders on our home library shelf—as well as books about the period of history. I invited my youngest to join me at the bookshelf to find other resources she might enjoy. She was intrigued by the cover of one in particular, Buffalo Bill and the Pony Express by Eleanor Coerr (HarperCollins,1995). Upon opening the book and fanning through the pages—seeing the larger font—she was even more excited. Large font. Easy, enjoyable reading. Unintimidating. We began reading and she immediately recognized some of the rider’s names and station stops from listening to me read to her sister. Learning about the Pony Express just got a bit more personal for her. Three weeks later, looking back, the “unit” was more than I could have imagined, mostly because of the level of engagement. There was interest and they fully “owned” what they were learning, because they were interested. The more we read, the more involved my learners became. When they had questions, we did our best to find answers. This paved the way to practice research skills. Language arts. Study skills. History. I know my girls remember a large percentage of what they learned. That makes my heart smile. But, there was something else that grew along with their knowledge…a relationship. They had something in common, a mutual interest, something they could talk and wonder about. They shared what they learned; got excited together. I could never have manufactured or orchestrated that aspect of the process. Even after 26 years of homeschooling, I didn’t see a “unit” growing from this book. Today, because of that deeper care for one another, they are outside reading in the fort. That’s another story for another day. People often ask what we use for curriculum. The short answer? We use anything which will help our children learn what it is they are trying to learn. And, if it involves real life, even better. Sometimes our curriculum looks traditional, like a math textbook. Other times our curriculum is a stack of Living Books. A few months ago, my middle schooler initiated a flower bed renovation project. She wanted a flower garden to call her own, a place she could eventually grow cut flowers. A few visits to the clearance section of the local garden shop and she had rescued several very nice—but wilting—flowers (aka curriculum). 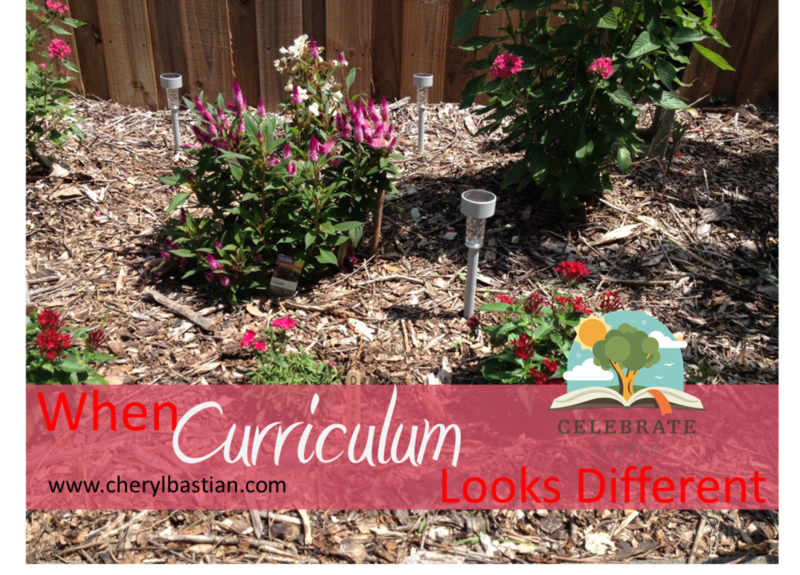 With a little research in a field guide and a how-to online tutorial (more curriculum), the plants were thriving. Today we added a few more resources to the curriculum—a collection of solar garden lights. Before placing them in the bed, we experimented with them in a dark room. So fun! The littlest learners were enthralled! “Flashlights without batteries!” one shouted. 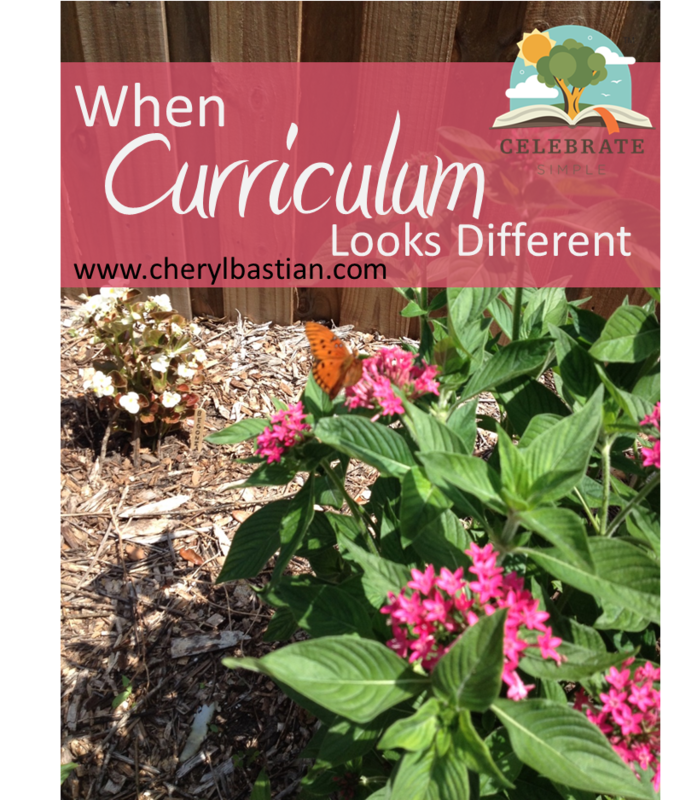 Curriculum incorporates all that a learner uses to learn the content of a specific subject. Though we are often tempted to stay within the means of what we know or have experienced as curriculum, in real-life the definition of curriculum broadens to include any materials used to foster a student’s understanding. When learning is real, relational and intentional it's remembered! Dad's first day of Spring Break invited us all--six learners ages 2-20 and two parents--into an educational extravaganza. We visited the Lego exhibit at Leu Gardens. Learning surrounds us. It's part of life. Gathered around the kitchen table working math problems, we often forget the rich learning which takes place when we venture out, walk through life together and learn. Last Friday, as we marveled at Lego creations and smelled Sweet Alyssum, I remembered how much littles (and bigs) need field trips, time out and about to learn together. the youngest learners instinctively balanced on the curbs and looked for rabbits. We didn't stop to run or roll down the hills, though it would have benefited their vestibular development. On another visit, we will definitely leave time to run and roll! the elementary learners compared the number of bricks in each sculpture. This allowed for practical comparison of place value and oral practice of reading and saying numbers over ten thousand. the learners, together, marveled at the patterns in the Lego sculptures. While we oohed and ahhed, we deepened our appreciation for one another and the things each considers beautiful. the learners worked together to navigate the map to find the places they wanted to visit. When they had a question, we encouraged them to consult an older sibling. While navigating, heading to the north forest, we heard owls hooting above our heads. We stopped, looked in between branches and gazed at these magnificent birds. 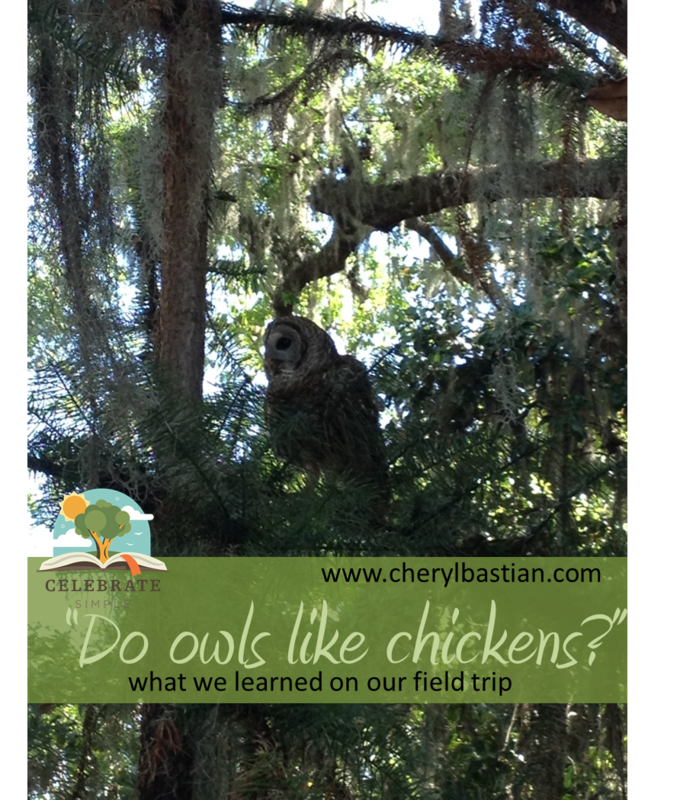 We watched as two owls called out their territory and then had a brief altercation with their talons right above our heads! The youngest learners asked great questions as their curiosity was sparked. I am glad we took time to look up! the middle schooler with a current interest in horticulture, stopped to read signage which explained foliage. She took pictures of plants she wanted to incorporate into our yard. the high schooler and college student enjoyed taking pictures of the amazing blooms, chatting about life as they walked along. I loved watching them spend time together and marveling at the wonder their siblings were taking in. "I think we need a picnic!" She articulated her need to stop, sit, and enjoy a snack. Honestly, we all benefited from the refreshing break. Snacks eaten, we headed out for the second part of the self-guided tour. After walking and enjoying the outdoors for three hours, we headed to the car. The youngest cried. We instantly thought, "She's ready to go home!" Instead, when I asked about her sadness she said, "I didn't see any rabbits!" Dad decided we should stop at the library on the way home and check out some rabbit books. Tears disappeared and a smile returned to her face. A stop at the library was a perfect way to close out our day together. What learning adventures await your family today? Maybe nature walks? Maybe puddles? Perhaps something which will come about spontaneously. Whatever that learning adventure is, may it be one which is memorable for your family. In the course of a week, three parents asked me this question. One in particular came through the Celebrate High School Facebook community. The answer is multi-faceted, unique to state requirements and learner’s educational and career path. First, parents must know and understand their responsibilities and freedoms under their state home education statute. Are home educated students in your state required to meet state graduation requirements? Does your state statute allow parents to oversee coursework and determine course credit? Are parents given the freedom to create titles for courses or must the state DOE titles be used (as is the case with some private schools)? The answers to those questions will contribute to your decision making process. 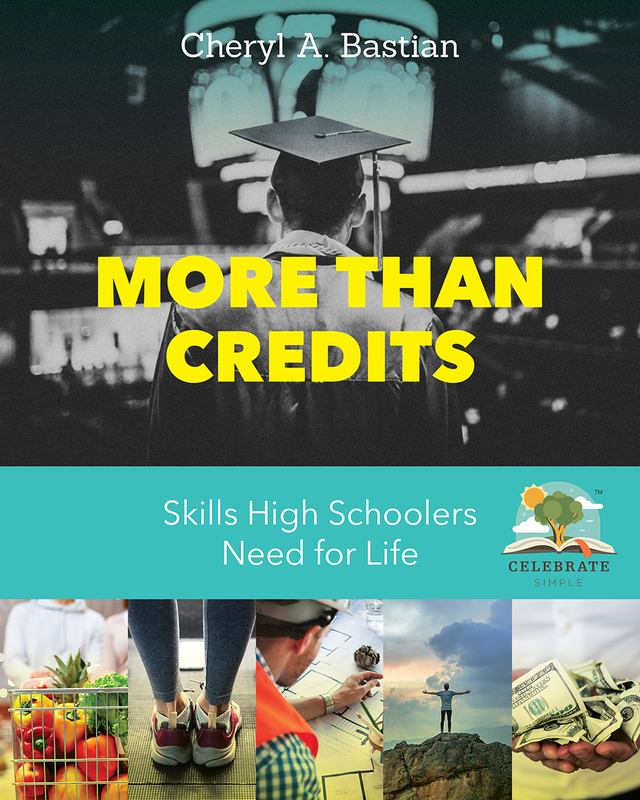 The second step in the process of deciding whether or not to award credit for work experience is to determine what the high schooler gained from his or her employment. Life skills? Knowledge? Personal development? The gains vary greatly dependent upon the high schooler's motivation, work ethic, job title, and employment requirements. Again, this is highly individual. Conversation with your high schooler is essential in the process of determining the gains. Why? Likely, as with most parents, you are not on the job with your learner to see and hear what he or she encounters or discovers. Engage in discussion. Ask questions. Listen for the young adult's passions, likes, and dislikes without condemnation. Often as young adults process, they need someone to mirror back or clarify what they expressed. I find it helpful to remind myself that when my middle and high schoolers share feelings, they are processing, perhaps sharing thoughts for the first time. The thoughts and feelings shared matter to them and when I ask clarifying questions, they often come to a better understanding of the situation. As you walk the journey with your middle or high schooler, not only will the gains of the current job become known, but the relationship between you and your teen will have great potential for growth as well. What skills he or she feels were learned as a result of the work experience? This is one of those occasions when I encourage parents to make a bullet-point list of skills and content the high schooler learned. Seeing the visual list often clarifies gains and aids in determining a course title which is specific and accurate to the experience. Examples may include Equine Science (barn assistant who interacts with equine professionals, observes or oversees equine care and nutrition), Nutrition and Wellness (assistant to a personal trainer), or String Ensemble (member of string quartet playing for weddings and special events). Are the skills focused on a specific content area or are the skills broad, focused toward soft skill and personal growth development? Looking over the content acquired, determine whether the skills were specific to an area of study (paid position at a zoological park) or broad, general and related to successful movement to adulthood (time management, personal growth, and communication skills). The difference may be titling the course Zoological Studies or Personal and Career Development. Did the high schooler earn accolades, awards, or hold specific leadership roles (positional or managerial titles) associated with the experience? For example, if your young adult is a shift manager there are likely managerial and leadership skills involved in what he or she does while on site. Perhaps a course title like Managerial Leadership, Leadership Strategies and Techniques, or Exploration in Culinary Management might be suitable. Our daughter became a self-employed, small business owner in middle school. She continued to build her business through the high school years. Not only did she create and keep track of inventory, she registered her business with the state, filed quarterly sales tax, figured profit and loss statements, kept a running log of sales and inventory, opened a checking account, built a website, handled emails, filled orders, and participated in craft venues. She earned money, but she also gained knowledge and work experience. With integrity, I awarded her one credit in Business and Entrepreneurial Principles. Our journey of awarding credit for paid work experience hasn’t come without criticism. Yours won’t either. In fact, you may have been told you can’t double dip —count paid work experience as high school credit. This happened to me. A well-meaning veteran homeschool mom informed me I couldn’t use work experience for credit. I listened. Yet, as a Mom who has the freedom to oversee our children’s education, knowing the life lessons and knowledge my young adults were gaining in their paid employment opportunities, I set out to research. It just didn't seem right not to be able to obtain credit from such rich, valuable life experience. I discovered my state provides the right for me--as a registered home educator--to oversee the education of my children. In that freedom, I am able to decide what can be deemed credit worthy and I can title mastered content accordingly. I could not ignore the fact that my high schoolers were engaged in learning while on the job. And, with the valuable conversations Mike and I were having with our high schoolers, we knew they were learning content not taught in a traditional textbooks or acquired through lecture. The skills and content they were learning required experience--opportunity to do, decide, make mistakes, and to try again--often under the guidance of a mentor or the supervision of a professional in a career area. In addition, I observed our high schoolers applying what they learned in the work setting to other areas of their lives. They would summarize what they learned on any given day, share their thoughts about what they experienced, and ask questions about things that intrigued them. Our discussions led to discovering deeper life truths as well the building of grit, growth mindset, and personal emotional intelligence—some of the most valuable assets to adulthood and future employment. What our learners were gaining on the job was credit worthy. 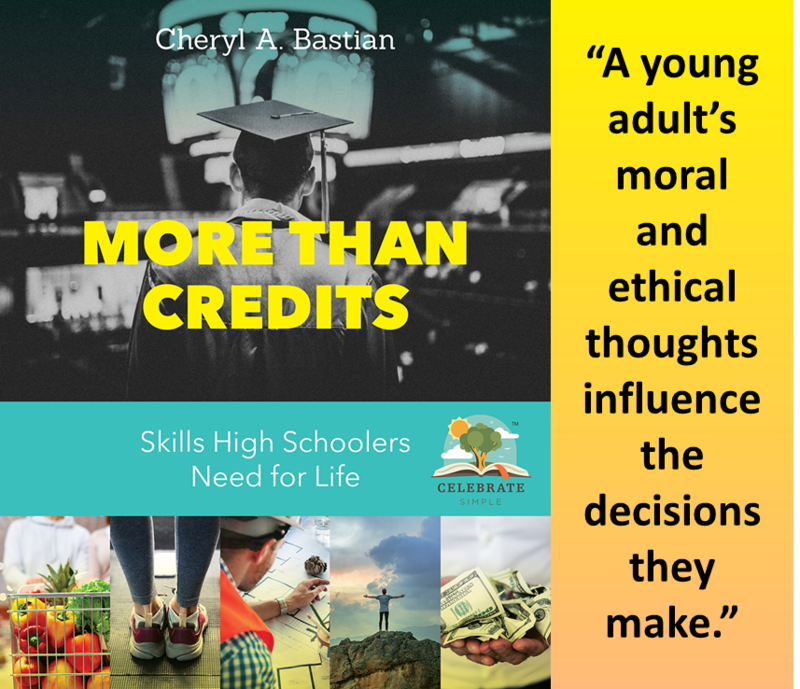 In my mind, the experiences—the content learned while on the job interfacing with professionals—was credit worthy, regardless of whether or not the high schooler was paid. Essentially, the learner was paid to learn! If life is learning and learning is life-long, it made sense to me that I could confer credit. Our second son was invited to apply for a summer job as a teacher’s assistant at a preschool. I knew the Director and many of the teachers who worked at the school. In fact, I had worked there as a high schooler and my experience became a catalyst for my choice to pursue early childhood education. Knowing the value of my personal experience, I encouraged our son to apply for the position. Yes, he would earn a paycheck, but he would be mentored by knowledgeable staff who knew the developmental needs of young children. Art camp began and indeed our son came home each day recounting his experiences. He commented on the conversations teachers had with students, how they listened and responded with open ended questions. He observed as teachers fostered curiosity and intentionally planned activities to promote wonder. His understandings of the developmental stages of art came from comparing preschooler's line drawings and seeing beaming smiles of accomplishment. Learning was experiences, not just memorized facts. In addition, he was learned about classroom management, developmentally appropriate art experiences, and the profession of early childhood education. The summer came to a close and he was invited to remain on staff for the next school year. He would be the outside assistant--the preschool physical education overseer. He accepted. This change in position brought opportunities to observe the stages of motor development in real life. He watched children progress from running to galloping, from climbing stairs one foot at a time to alternating feet. He knelt down beside children who poured sand in funnels and floated boats in water tables. We talked about discoveries he watched children make and asked me about my experiences with children on the spectrum. The knowledge he gained through his experiences at the preschool were some of the very same things I studied in my college early childhood college courses. At that moment, I realized the fifteen hours a week he was working at the preschool was preparing him with life skills of time management, communication skills, and workplace etiquette, but it was also equipping him with a foundation of knowledge in the area of early childhood development. In his junior year, I awarded him one credit in Introduction to Early Childhood Education. Where is your learner employed? Maybe it is the local hardware store where knowledge of tools and home repair are prerequisite for employment. Maybe your high schooler was hired as a shift manager at a local eatery, managing and overseeing a team of co-workers. No matter where your young adult is employed, consider the skills being acquired, the career-related vocabulary being obtained, the decision making involved as part of the job, the conversations being had between coworkers and employers, and subject content being mastered through the opportunity. No doubt much more is being learned than you or your student imagined! Generally high schools title work experience Executive Internship or Work Study. These are broad brush titles which say nothing about the student or content. However, if the home educating parent has the freedom to title courses, course titling can be strategic, mirroring the student’s interest and the content knowledge gained. Here is a small sampling of title examples. Consider the course titles provided in this blog post about electives. Children entrusted with little will one day be able to be trusted with much. What is your child able to be trusted with today, right now? It's hard, isn't it, to say yes--to trust, to risk. When I was a young mom, I held on more tightly, regulated and controlled what I could, fearing the worst, yet longing to raise children who would one day to be independent. 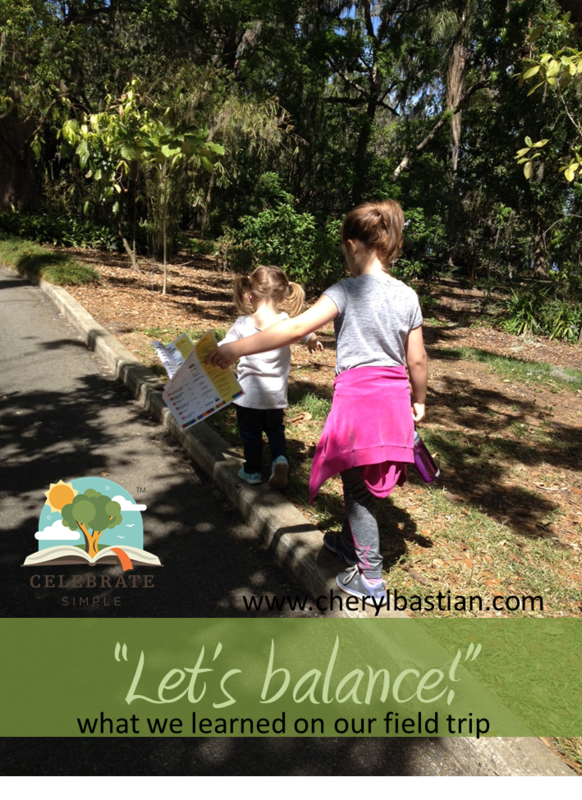 As my oldest children grew, I realized I was doing them a disservice. They wouldn't become responsible, and one day independent, if I waited until the day before I expected them to launch. I had to change my thinking. If one day I wanted them to be trusted with much, I needed to begin trusting them with little. It would be a process. A receipt from the grocery store. My two-and-a-half-year-old always wants to carry the receipt, along with the spare change. When I give her the handful--all of it--she feels empowered, trusted. And, she is mindful of what she's doing, like she is guarding a million dollars! The keys to the house. When we pull in the driveway, my six-year-old always asks for the keys as soon as I pull them from the ignition. She wants to carry the keys and unlock the front door. In doing so, she feels capable, able to help the family enter the home. My cell phone. A few weeks ago, Mike and two middle girls took a road trip to the softball World Series. When I called to check in, one of the girls answered the phone. The proud voice on the other end exclaimed that Dad let her be the secretary, especially when he was driving. She felt important, able to meet a need. The empowerment to independence was indeed a process. When the day came for each child to sit in the driver's seat of our car for his or her first solo ride, babysit, or travel alone, I knew he or she was ready. Each of the children had had a multitude of opportunities to prove responsibility and trustworthiness. On our second son's wedding day, I remember reflecting on his readiness to not only be responsible for himself but also to consider the well-being of another person into his days. One day he was entrusted with bringing in his bike from the rain, another day to was instructed with how to use grandfather's fishing pole. A year or so later, he was given command of a canoe of younger scouts. Not too long after, he asked for the keys to our car, and then, a few years later, he waited at the end of an aisle for his bride. Trusting him with a little grew to trusting him with much. It was a process, one which took time. And, looking back, the years flew faster than I ever imagined they would. "Mom, can we go on a date?" It starts when they are little, but it doesn't have to end there. Teens and young adults LOVE intentional moments with their parents, too. A wise, older mom once encouraged me to foster a relationship with my children when they were young. I have to admit, it wasn't always easy to be excited to watch ants make a hill, walk around the lake hunting for tadpoles, or play Candyland for a second or third time as laundry hollered to be loaded and dinner shouted to be started. There were seasons of new babies and illnesses. But, I listened to my friend's her sage wisdom, what she had learned from her experiences. "If you want a relationship with your young adults, start when they are little and never stop!" Twenty-seven years into this parenting thing, I can say I was intentional about putting my best foot forward to engage in my children's lives. But, I will be honest. I wasn't always happy about setting aside my ideas or my activities. There were moments I complained. There were days I was tired, but persevered anyway. My children saw my intentions. What I learned from that older mom? My efforts mattered--all of them, even the ones that were not picture perfect. What do we do when children get older, when dates are more than playing a game (though some older children still enjoy games), stopping by the playground, or catching butterflies? Or, what if life circumstances kept us from spending as much time with our children as we would have liked? Do we throw in the towel and assume a relationship with our teens can't be fostered? We start with where we are now--parent and child, parent and young adult. No one outgrows the need for relationship and time spent on relationships is never wasted. So, where do we start (or continue) with our older children? Start with what they enjoy, what they like. With five very different teens, young adults, and adult children, the times we spend together varies. 1. Sipping hot chocolate. Outside on the patio or sitting cross-legged on the couch, just the two (or three) of us. 2. Taking a walk. This is a favorite for one of my health and fitness-minded young adults. 3. Going to the thrift store. Often there's a goal for our adventures at our local thrift store's half-price Wednesday. We most always arrive home feeling great about the time we spent together and the bargains we find. 4. Working out together. This is a HUGE stretch for me (no pun intended!) but makes my young adults chuckle. Yes, we've had some laughs at my expense! Laughter is part of relationship building. 5. Painting the bedroom. At some point in the teen years, most young adults desire to freshen up their room. Spending a weekend choosing a color and applying the new coat of freshness can make memories, for sure. 6. Designing a website. My entrepreneur asked if I'd help her figure out how to build a free site. A few days later, we were able to say, "I couldn't have done that without you!" 7. Going shopping. My children know shopping is not something I really enjoy. I like bargains, but I have other things I would rather do. And, with eight children, it seems someone always needs a new shirt, underwear, or a larger size sneakers! And, often the request doesn't come at an ideal time. However, if one of my children needs something and asks me to go along, I'm there. In fact, one of my favorite mommy heart moments was when my adult child set up his first apartment and asked me to go with him to give my opinion on a couch. I was honored and accepted the invitation with a warm heart. I will never forget that day! 8. Eating a plateful of nachos. While my boys were playing high school baseball, they would often arrive home starving and needing to process the action of the game. It was often hard to keep my tired eyes open--and I rarely remembered the fine details of every inning--but those late evenings were more than worth the sleep I lost. I will admit these late night dates made maintaining weight a challenge. 9. Reading a book. One of our young adults loved to read and then engage in conversation, pondering thoughts with someone else. Often Mike or I was that someone else. What an honor and a privilege! 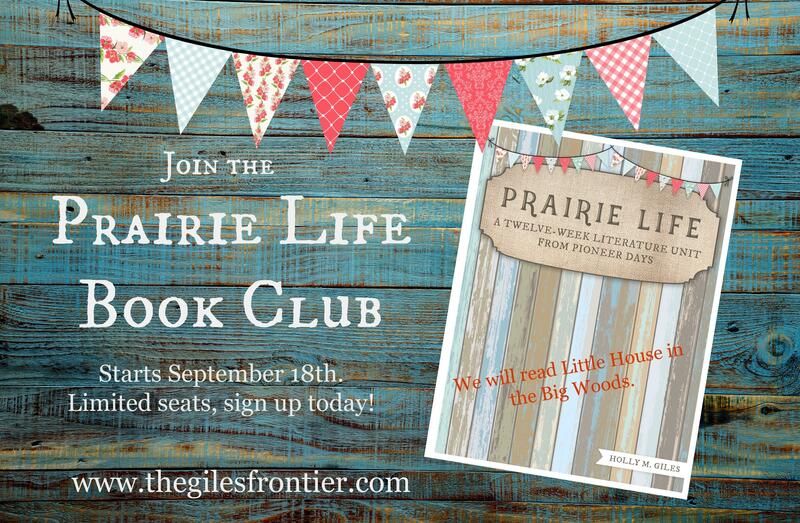 Perhaps your young adult might enjoy this type of time together. 10. Sharing an appetizer. Sharing an afternoon appetizer at a local restaurant may be just the change of scenery your young adult needs. Often restaurants offer afternoon specials to encourage patrons. Research the deals in your area. It may be just the renewal a relationship needs. 11. Solving a jigsaw puzzle. Though this hasn't been a terribly frequent choice, when we did engage in this challenge we were able to say, "We accomplished a task together." 12. Making greeting cards. From the very early years of our marriage there hasn't been a lot of extra cash in the budget for cards. Creating cards to make someone smile, has definitely been heart-warming. Making several to keep some on hand for needs that arise may be a great way to spend time with your creative. 13. Visiting a museum. One of our young adults enjoyed visiting museums, especially art and history. Interestingly, I became quite interested in both art and history, neither of which were natural interests of mine. I love when the interests of one family member rub off on another. 14. Volunteering together. When my high schoolers began to need community service hours, we were always looking for venues to serve. Though it would have been easier to drop off and go, when invited to stay, we accepted. As it turned out the experienced blessed several family members for several years. 15. Enjoying free coffee. I have a young adult who is very frugal...and loves coffee. This has definitely been a favorite date, especially National Coffee Day rolls on September 29. 16. Using a coupon. In a large family where money can be tight, we have gotten creative and in the process have enjoyed great times together, frugally. Honestly, once they got the hang of it, my teens and young adults came up with amazingly great deals and ideas to send time together. 17. Riding bikes. Whether biking for the sake of staying fit or enjoying time outside, this has been a favorite in all stages of life. 18. Doing a DYI project. If you have an innovator or a creative, this can be a fun way to spend the afternoon. I have learned fun DIY ideas from my young adults. 19. Enjoying nachos, AGAIN! WHEW! The high school ball nights turned into freshman year of college--seemingly overnight! My oldest--then a college freshman--invited me to share his nachos, a little later in that season of life...at 1 AM. I said YES! And, I never regretted it. He continued to ask and I gained what I call the Mom Freshmen Fifteen! 20. Going BOGO. One of the favorite date requests for our youngers and olders is BOGO shakes at the local Steak N' Shake. The waitresses know us well! 21. Sharing a tradition. Some of our dates were a vehicle for generational sharing. Consider the traditions of your family and how you might share those with yet another generation--shopping for sibling Christmas presents, coffee with Grandma, attending Memorial Day veteran celebrations have been among our favs. 22. Learning a new skill. Learning is life-long. We parents can model this by inviting a young adult to learn a new skill alongside us or we can offer to help a young adult learn a new skill, perhaps one he or she has desired to learn for awhile. Together, my young adults and I have learned how to make lollipops, plant a garden, paint window shutters, and sew aprons. What new skills may await the relationship with your teen? 23. Opening a bank account. Sometimes life's seasons bring amazing date opportunities. Embracing these times, we have with our young adults matters. Often we grab an ice cream or coffee on the way home! 24. Cashing in on rewards. I wasn't a big coffee fan. However, when one of my young adults wanted to join a reward program so we could date and earn rewards, I was all in! And, we've both enjoyed the time together and the freebies! 25. Sharing life! Moments with your teens and young adults don't have to fancy or elaborate. The important point of cultivating a relationship with your children is being intentional about taking time to share life together. In doing so, the parent-child-young adult relationship is built and fostered. I have been asked if our family will watch the inauguration. Wait! Before you decide to click off this post thinking I am about to get political, I encourage you to read on. This post is about relationships. My brother and I waited in anticipation as Grammy turned the knob on the television. One click, fuzzy white. Another click, more fuzz. One more click and there it was, the Inauguration. People lined streets, flags waving. Bands were playing. The date was January 20, 1973. This was the day we waited for; the day we would spend at Grammy’s watching the inauguration of Richard Nixon. We didn’t really understand the scope of the meaning behind an inauguration. What we did know was we loved spending time with Grammy. Leading up to the day, she talked about my Grandfather’s service in the military. We walked the memorial park near her house. She put a flag out on her porch. We could tell from our discussions and her actions that Inauguration day was important. Grammy made us curious. And, we loved our time with her. As for any celebration, Grammy purchased snacks, snacks we could eat while watching the event. Having not seen an inauguration before, my brother and I had lots of questions. There was security in knowing Grammy would be seating next to us in the living room—knitting needles clicking away—eager to answer any questions. She was so patient. It would be a day together, watching and learning. Tomorrow at the Bastian home, we will watch the Inauguration day events. Not because we agree with everything that has been said or everything that has happened. But because we are an American family who is grateful for our nation and the process by which we elect leaders. Tomorrow, we will be watching and learning together. There will be questions; likely lots of questions since we have littles who have never witnessed an Inauguration. I will know some answers, others we will have to research together. We will learn tidbits of trivia, nuggets of history, and have discussions. Some of the children and young adults will likely share thoughts, ideas they are processing. And, we will have snacks. It will be a day of learning together, watching and listening. Watch footage and coverage of past inaugurations. Read a biography. Our littlest learners have enjoyed The Picture Book of series by David A. Adler, president biographies in the Random House Step Up book series, Garrard Publishing Company's Discovery biographies, and Childhood of Famous American biographies. Biographies in the Signature series have invited my older learners into history. It was a stress-filled day. Guests coming; comments becoming sarcastic. I knew a few quiet, intentional minutes would be a great reset--a reset and a relationship builder. And, we could go to LONDON! The text and illustrations of A Walk In London by Salvatore Rubbino would take us there. I asked a learner to go to the library bucket and find the London book. Once retrieved we sat on the living room floor, backs positioned against the couch. I read the title and author from the cover and opened the book. The illustrations immediately caught the attention of my ten-year-old. Her excitement was quickly caught by my five year old. I began to read and we were immediately transported to the streets of London, each page highlighting a landmark or introducing a bit of history. We talked about words we didn't know; ah-ha'ed over new facts. For twenty minutes we listened and learned together--learners from five to thirteen. When I closed the book, stress had been replaced with calm and we had enjoyed our minutes together. This book was our ticket to visit a country, but it was also an opportunity to reset attitudes and deepen our relationships. If you enjoyed A Walk in London, check out A Walk in Paris and A Walk in New York also written by Salvatore Rubbino. Books can also bring comfort in difficult times. If your family is walking through a challenging season, snuggling up together to read might be one way to invite calm to the moments of your day. Check out this post, Light-Hearted Reads for Difficult Moments. This year marks more than 30 years of working with little learners; 27 of those years watching our little learners grow and learn daily in our home (yes, we still have some little learners!). I watch the wonder in their eyes and listen to the curiosity in their questions. Along the way, I've come to understand that young children have innate interests--many of them! One of those interests is animals; all animals, big and small. Couple a young child's natural curiosities with inviting picture books and non-fiction reads and you have the makings of a learning frenzy! I am sure you have watched your children--or those you work with--choose books off a shelf. First one, then another. 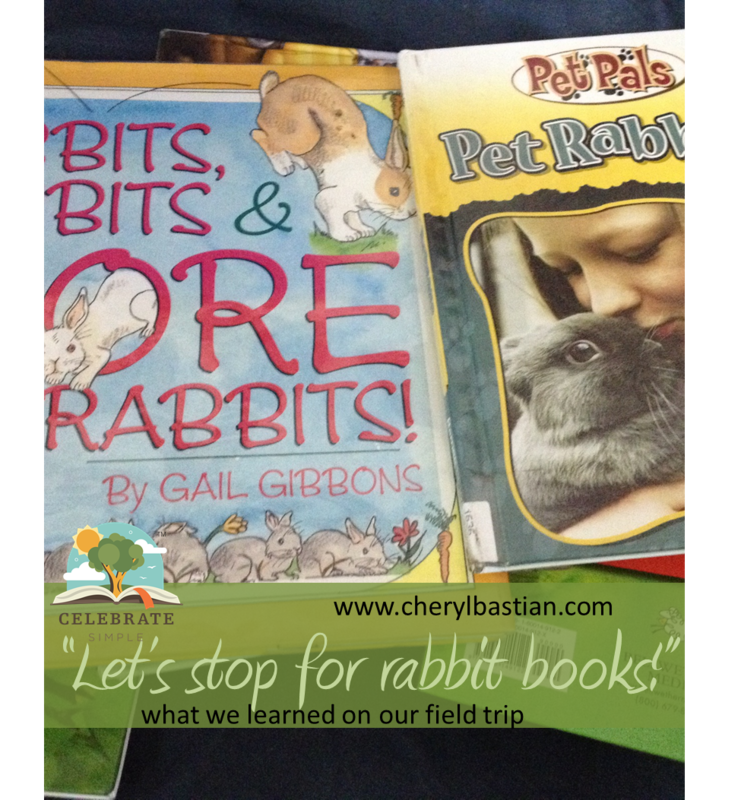 Reflecting on my years of watching children gather farm books--a combination of treasures they've found in the local library and our home collection--here are the books chosen most often. Barn Dance, Bill Martin, Jr.
Do you have multiple children at multiple ages, preschool through elementary? We do, too! One of our favorite family read-aloud treasures is the timeless classic Charlotte's Web by E. B. White. Pop some popcorn or serve some hot chocolate and enjoy listening together as Mom or Dad reads. Reading aloud is intentional, real, and relational. It matters! Cinnamon scents. Bustling shoppers. Joyous music. Holiday visitors. Schedule changes. Lights blinking. Holidays can be a sensory, anxiety-ridden nightmare for some children. The holidays can be frustrating for children sensitive to sensory stimulation or anxious thoughts. Add holiday spontaneity and change of routine to the mix and there's a potential recipe for outbursts, breakdowns, and tantrums, making for a less than pleasurable holiday season. Fortunately, there are practical helps parents can use to lessen the stress of a season. Interpersonal interactions. Holiday visiting can be stressful. Some children worry about talking to guests. Others are concerned they won't know the guests and therefore feel uncomfortable. Knowing your child's unique thinking pattern, anticipating his or her concerns, and helping to process feelings associated with those apprehensions are beneficial in beating holiday anxieties. One way to coach a child through interpersonal fears is to prepare ahead of time. Talk about who will or won't be at an event. Processing thoughts and feelings often helps to reduce anxiousness and over time offers children life skills to work toward self-regulation. I know parents who chose to host a holiday party in the child's home where the safety and familiarity of home helps lessen anxiety. Being in the home, the child has the ability retreat to a quiet place for a short time, if needed. This is a great option for some families. Demanding interpersonal communication is generally not the best solution and could actually bring on guilt. Many children who struggle with anxious thoughts are able to conceptualize the cause and effect of not communicating. In fact, they often understand that not talking to or acknowledging a person could have relational consequences. As a result, they may feel guilty about their inability to communicate. And, what about those unexpected visitors? When an unexpected visitor comes to the home, a child who is anxious around people but feels safe knowing the parent will respond if needed, will eventually be able to work through the uncomfortable feelings. As the child experiences his or her ability to regulate his or her anxiety, confidence and resilience grows. In turn, the child becomes better able to regulate through--even predict--anxious times. Sensory input. The holidays are packed with sensory experiences--sound, texture, smell, taste, and emotions. Knowing which sensory triggers may upset a child can be helpful when planning and scheduling. For example, three hours of light sighting may be too much, while driving by a few houses to and from normal errands might be more enjoyable. Food sensitivities. Holidays include yummy foods. Monitoring sugar, food dyes, and caffeine--which become stimulants in some children--may be helpful. In children with heightened sensitives and anxiety, these items can be doubly troublesome. Talking with your children about how these things make them feel--shaky, jittery, nervous, heart-racing--they may be more likely to understand how to make better food choices. Again, this is another step in providing empowerment to children who tend toward anxious thoughts and actions. Pondering daily triggers offers insight to potential holiday obstacles. If your gluten-sensitive child is invited to a Christmas party, consider sending an alternative treat option. If your family has been invited to Grandma's house and you know there will be a vast selection of soda pop, consider bringing a beverage your child enjoys to add to the collection. We have also used these occasions to help our children process options prior to arriving. These conversations include talking about how to choose wisely, offering insight to how a particular food has caused a trigger reaction in the past, and brainstorming solutions to how to react graciously should certain foods be served. Prepare. Preparation is powerful. Talking with children ahead of time--in the car on the way to an event or offering time for children to share concerns the night before a big day--can help ward off anxiety and and stress. Knowing the schedule of events--for some children--can ward off anxiety. However, if your child can only comprehend small chunks, preparation may be your constant companion. Talking through upcoming events--or events which have passed--models for a child how he or she can begin to learn to self-prepare. With preparation, outbursts from over stimulation may be avoided. Observe. When the parent intentionally observes behavior and considers how that behavior may be related to particular situations, the parent is able to help a child not only process and work through the situation but also help the child recognize personal triggers. Knowing the triggers, the parent can further help a child work with those triggers to lower anxious thoughts. Limit. Let's face it, all of us--children and adults--have a tipping point, a point when holiday festivities become stressful. Consider the challenges your child faces on a daily basis. Perhaps there is a heightened awareness to smell or lighting. Maybe there is a sensitivity to food dyes or even anxious feelings around strangers. Use those daily challenges as a guide for what might have to be limited during the holiday season and plan accordingly. Model (self-regulation, self-control). My children--all of them--have benefited from my purposeful external processing. In other words, when I find myself in a situation which requires self-regulation or control, I process my thinking. For example, if we are visiting another family's home for a holiday dessert, while on the car ride to the home, I might say, "When I arrive at Mrs. Smith's home, I know she will have many yummy desserts to choose from. I will be tempted to sample everything. Instead, I am going to choose the two desserts I would most enjoy. And, I must also remember that nuts give me headaches. So, I probably will not choose anything with nuts, even if it is my favorite." This type of processing allows children opportunities to "hear" how other people process through decisions but also how people regulate or control their choices. Sleep. It is easy to overload the holidays, staying up late to make the most of the hours in our days. In addition, with the excitement, children--like adults--are often fearful they will miss something should they fall asleep. The results are wide-eyed children awake long after the regular bed time. Being overtired can heighten sensitivities. When looking over the holiday schedule, consider how many late nights your family will be able to handle. Remember, children are not the only ones who will benefit by making sure sleep is a priority. We will not be able to ward off every potential challenge for our children. However, creating an environment--even during the holiday season--where children feel safe and listened to will help them overcome low to moderate levels of sensory stimulation or anxiety. When in fact, reality brings an unexpected--or even an anticipated--stressful situation, helping children process through the challenge will allow them to learn how to self-regulate. This learning is not only a welcomed treat during the holiday season, but also a life gift. It's that time again. Time to paint the exterior of our house. Who is the first person I consult, to find out what needs to happen first, then second, and so on? My Dad is a carpenter genius. I remember when I came to this conclusion. I was an elementary girl, a constant companion alongside my Dad in his wood shop. In that shop, he created from wood, sometimes the wood from trees near our home. He made dining room chairs, grandfather clocks, hutches, and my toy box! Our kitchen--the one in which I prepare meals for my family--was crafted in his mind and made with his hands. He is my Dad, but he is also a mentor. He is a mentor for me and for my children. We learn from his genius. 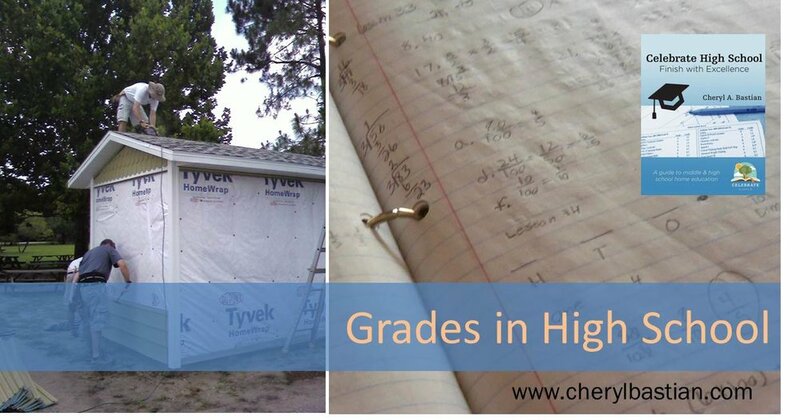 He has helped us with many home projects--roofing, kitchen and bathroom demo and design, home add-ons. I am beginning to realize my time, our time with my Dad--the time from which I can soak in all he has to share--might be limited. I want to soak in all the wisdom I can, and I want my children to have the same opportunity. So, last week began our house painting project. It was a PROJECT! Simple paint and brushes, but a TON of work and perseverance. Pressure washing to finish, prep to fill cracks, trim work to be painted, shutters to be covered, and brushes to clean. But we did it as a family--grandpa, parents, and children! Together. Each person quickly found they were better at one job than another. And, for some there were skills to learn. Some learned to trim paint, others practiced rolling. Some found joy cleaning brushes--I mean, playing in water! I realized my children were learning alongside my Dad--a legacy--much like when I learned by his side in the wood shop, alongside him when we added-on to our house. I want my children to learn all they can from him. Indeed, every child--toddler to adult--learned something this week. Some heard and then imitated my Dad's positive attitude. Others learned how to hang a roller on the side of a paint can. Another observed how Pop angled the brush to paint the mortar joints. It was a PROJECT with lots of real learning, from a man who is leaving a legacy. As I painted, I wondered. What legacy I will leave with my children. Will it be the books we read together? Will it be the cheesecakes we baked together? Will it be my positive comments and words of encouragement or the "be a blessing" I spoke as they left the house? Will it be something I couldn't have fathomed, something which has yet to take place? I don't know what legacy I will leave with my children. But I do know one thing. The time, effort, sacrifice--the intentionality of my days--will matter. I know so. I learned that from my Dad (and my mom, to be honest)! Parents, we will leave a legacy. What will that legacy be? Likely, it will be something you and I did intentionally, with items which are real and personal, with moments which are relational in nature. Our moments matter, every one of them.